1) Officially, registration is from 9 to 9:30 AM. Unlike previous years, we are looking to streamline the registration process that often caused us to start late. Assuming that you have received a registration confirmation email from me, you will not need to re-register at the event. Therefore, if you have a hard time arriving early, it is fine to arrive close to 9:30. 2) As you enter the auditorium for the opening assembly, please note that this year’s Chidon finals have the largest number of participants in many years. We are thrilled to witness such large growth, but that means that the venue will be very crowded. We have arranged to rent several dozen extra chairs, but space will still be tight. Therefore, we ask that you be considerate of others and not put coats or other items on chairs that other participants will need to sit on. 3) Parking can be difficult in Manhattan. If you have a choice, I recommend using public transportation, with the 1 train being the closest subway line to MDS. There are several lots where you can pay to park near MDS, with High Rise Parking (210 West 71st Street) being the most affordable option that I know of. 4) If anyone would like to daven Shacharit near the Chidon, the West Side Institutional Synagogue (120 W. 76th St., New York, NY 10023) has an 8:30 AM minyan and is a 5-10-minute walk from MDS. 5) At 9:30, we will begin the opening assembly, in which we will show a brief video presentation about the International Bible Contest that our Chidon’s winners attend in Israel. Following that assembly, you will be sent to the exam rooms, where the written contest will take place from roughly 10 AM to 12:30 PM. There will be 2 parts to the exam, with a short break in between them. Only actual contestants are allowed in the classroom area where the exams take place. 6) Please be sure to bring a #2 pencil, because the exam will require you to fill out a scantron form. In addition to bringing pencils, students are allowed to bring snacks with them into the testing area. 7) While students are taking the written exams, we are honored that renowned Tanach educator Rabbi Nathaniel Helfgot (http://netivotshalomnj.org/about-us/our-rabbi/) will be giving an shiur (lecture) about Psalm 127, which will be open to parents of all backgrounds and knowledge levels. In addition, there are many interesting museums and attractions within walking distance of MDS, which you are welcome to visit while your children are taking the written exam, such at the Museum of Natural History and Central Park. 9) The closing assembly will begin in the auditorium around 1:15 PM. We will hear from a past Chidon champion, and we will conduct the final round of the Chidon for the high scorers from the morning’s written tests. Chidon finalists who are not called up to the front for this final round will be able to text their answers to the video questions for a chance to win prizes. So be sure to bring a cellphone if you’d like to participate in that. This year’s closing assembly will also include the school video contest, where the audience will vote by text message for the winning video. 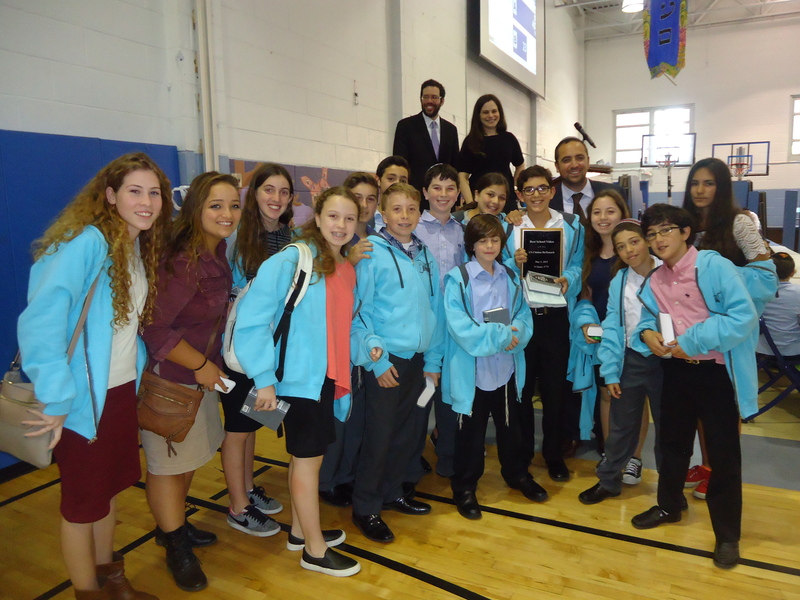 At the end of the closing assembly (around 2:45 PM), we will present the winners with their prizes and conclude by singing HaTikvah. You are currently browsing the US Chidon Ha-Tanach blog archives for April, 2015.